As the battle to bring down Clifford DeVoe (Neil Sandilands) races towards a major turn, the bodies have been falling on The Flash. Last week, we saw DeVoe's baddie, The Thinker, ice Caitlin's inner-Killer Frost using a power he absorbed from Melting Point before taking over the physical body of Ralph Dibney (Hartley Sawyer). Those who have previously been inhabited by the mad genius' increasingly elevated consciousness have all died from the invasion. So it looks like Ralph's sacrifice to save his teammates from DeVoe's assault on S.T.A.R. Labs was both his final act and his most heroic. From '30 Rock' to 'Scrubs,' we've selected some of our favorites. 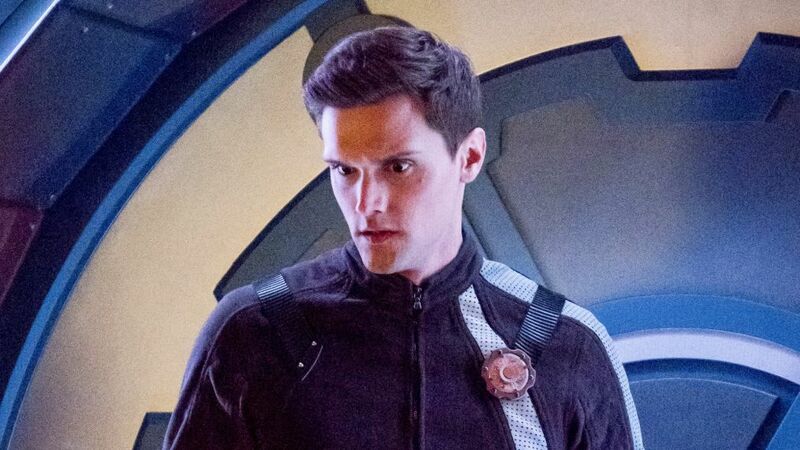 Here, executive producer Todd Helbing explains the end of Sawyer's Elongated Man and what his death will mean to Team Flash. We've gotten Killer Frost back before, but is this a permanent situation? Are we done with her? Well, we'll see. You know, right when they got to this place where they could interact and be cool with each other, she's gone. And you know Caitlin [Danielle Panabaker] misses her. So she's gonna try to figure out how to get her back scientifically, if that's even possible. Maybe there's an emotional component to it. And she'll seek the help of Doctor Finkel [Barry and Iris' shrink, played by Donna Pescow] at one point. And yeah, at the end of the season, we sort of explain that as far as how she works within Caitlin, Killer Frost isn't quite as simple as everybody thought. Pretty much everything is coming back. So where does that leave pilots? Good, because we love how much fun Danielle has as Killer Frost. Yeah and so does Danielle, you know? And so do all of us! [Laughs] You know, Caitlin Snow is very much a scientist and things need to make sense to her. So there is part of it where it's like, 'Oh yes, when you spike your adrenaline, this happens, this is the result.' But it's not quite that simple. And so, as she goes on this journey to figure out exactly what causes her, she gets this answer that she wasn't expecting. And does she have the support of the rest of the team to go kind of searching for this? She does, but at first she's kind of taking this all on by herself. It's very much with the theme of the season — 'We are the Flash' — she realizes that she's gonna need the help of other people. She reaches out to Joe [Jesse L. Martin], she reaches out to Cisco [Carlos Valdes], and it's really the team that is gonna help her. Ralph's... he's gone. Look, the journey that we wanted to take Barry on was very much [this]. He felt responsible for this guy and he brought him into the team. And even when he was in jail, the team was helping Ralph become a hero. And then Barry trains him and it has this impact on him that changes his sort of philosophy on how to stop villains moving forward — particularly the Thinker. And like I was talking about with Caitlin, it's very much a matter of Barry shouldering these problems himself in all the seasons up to this point. Will this get Barry out of that headspace of thinking he has to do it all by himself going forward? Yeah, absolutely. Last season in the finale, he made the decision by himself to save Central City and the world by going into the Speed Force. He doesn't make decisions like that anymore. He consults with the team, he needs everybody on board and that's how they act moving forward. Will DeVoe stay in Ralph's body? Because that will bring a new emotional level to the battle they'll have to do. Oh yeah. As you saw in episode 18, that was all part of DeVoe's plan. Ralph Dibny's body is the only one that can sustain his mind. So yeah, he needed that body and like he said, it had an ancillary benefit. He could fully return to form. So this whole thing that you saw with his wife Marlize (Kim Engelbrecht), you know, he was using these drugs to keep her in love with him because he knew how strange that was gonna be with him inhabiting other bodies. Now the two of them are back, but as you noted, the emotional component of DeVoe has become less and less and less. That is really the big challenge on the DeVoe side... Marlize realizing that her husband is pretty much gone to her forever. 'The Flash' Returns With a Twist for Carlos Valdes' Cisco—Danny Trejo's Breacher! Danny Trejo reprises his role as Breacher with an offer that could cost Team Flash a member! So for the most part, we've probably seen the end of Hartley. Yes. There's one little thing that DeVoe does to taunt Barry, but that's all I'll say. And you know, Hartley Sawyer is so amazing, and you know ... But it's like, you gotta stick with the plan. This was something that we plotted out a year ago [and] we explained Hartley exactly what his journey was gonna be. And how is the rest of the team affected by it? This is really the first time they've lost a teammate. That's exactly what we wanted to [play]. They all feel different levels of responsibility — Barry the most because he's trained somebody who died on his watch. It's all about how you overcome a loss like that, how do you let that fuel you, and also, what Barry learns is he's not the only one dealing with that grief. You know, there's a future episode where it all comes to a head. I think sometimes on network shows there's the sort of instinct to wrap these things up, but we made a conscious effort to spend multiple episodes [dealing with this]. It factors into the rest of the season. It's not just, oh, he dies in Episode 18 and that's the story and then they move on. It takes a while.